Below is the article that caused the suggestion that we need a Royal Commission into how development is conducted in this country. "Develop or be punished," by John Masanauskas. (Herald Sun, 2 June 2018. A DEVELOPER lobby has called for suburbs which don’t pull their weight on housing supply to be punished with less investment in infrastructure. Urban Development Institute of Australia state CEO Danni Addison said the state government should set housing targets for each council area to cope with Melbourne’s rapid population growth. “That new housing stock, if delivered, should be accompanied by infrastructure investment from government,” she told a UDIA event yesterday. Developers told the event councils like Boroondara and Stonnington were not providing their share of new housing. Ms Addison said there were “politically unpalatable areas of Melbourne where growth is uncomfortable ideologically or from a position of NIMBYism (not in my backyard)”. “But if that growth were to be followed and serviced by infrastructure, then I think the community would definitely be more at ease,” she said. 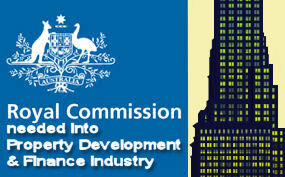 Planning Minister Richard Wynne said Melbourne had the highest growth rate of any city in the developed world." Developers' World should be a THEME PARK, created for these growthists. They can have towers reaching to the sky, into the clouds, and people hemmed in cheek to jowl and face to face - all paid actors. They can experience the crush of standing in queues waiting for already overloaded public transport, and the stresses of congestion. They can watch crowds flowing in, and crushing the lanes and roads of the city, all pushing up real estate prices in a simulated game. This would alleviate the pressure of their dreams being imposed onto the public. They can have their "fix" of endless growth, and city-cramming, so suburbs in Melbourne can be safe from their desires, their malignancy and addiction. There are e-cigarettes for smoking addicts, AA for alcoholics, safe drug-rooms, so why not a safe place for growth addicts such as property developers, where they can have their addictions alleviated and treated? I think you need to add wads of cash to make the simulation more satisfying for them. Also you would need some politicians (or convincing actors as you suggest) to invite them to 'exclusive' forums where they can feel special, powerful, influential and admired. And then they can each try and build taller and taller buildings - perhaps reaching to the moon itself! Oh, the ecstasy of making a statement like that!! The pure egotistical pleasure of it! !